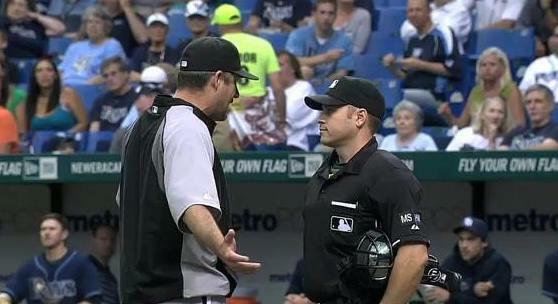 Robin Ventura and Mark Wegner discuss current events at the Trop. What’s being talked about is the spectacle. What the spectacle entails is raw, flashing emotion, unconstrained by things like logic or reason. The emotion’s place of origin was the mouth of Ken Harrelson, White Sox broadcaster. Yesterday, it absolutely captivated the baseball-viewing public. What are you doing? He threw him out of the ballgame? You’ve got to be bleeping me. What in the hell are you doing? What are you doing, Wegner? Yes, he actually said, “bleeping.” Hear the Hawk rock the rant, everyone. Good times for all. The money shot involves Harrelson’s homer-centric howls, directed at plate ump Mark Wegner in response to White Sox starter Jose Quintana’s fourth-inning ejection, after the left-hander threw a pitch behind Tampa Bay’s Ben Zobrist. Like many money shots, of course, it feels kind of empty without some relevant prelude to bring it alive. Why, for instance was Hawk so riled up? The answer is somewhat involved, and begins in the sixth inning of Tuesday’s game, also between the White Sox and Rays. A.J. Pierzynski, at first base with one out, was forced at second on a ground ball by Dayan Viciedo. It’s standard procedure for runners in that situation to go in hard at second, trying to prevent a double play. Pierzynski, however, went in late and spikes high, spearing second baseman Zobrist well behind the bag. The two shared some choice sentiments after the play, but each eventually went peaceably on his way, and the issue appeared to die there. Pierzynski batted three more times in the game, once with nobody on and two out, another time as the leadoff hitter while his team held a 6-2 lead, and wasn’t so much as brushed back. You gotta be kiddin’ me. That is so bad. That is absolutely brutal. That is unbelievable. I’ll tell you what—they have got to start making guys be accountable. Given an evening to think it over, however, the Rays apparently decided that they wanted a piece of Pierzynski after all. In the third inning Wednesday, with one out and first base open, Rays starter Alex Cobb drilled the catcher in the right shoulder blade. According to the Code, Pierzynski offered cause, Cobb retorted with effect, and things should have ended right there. That is totally absurd! That just tells you—here’s an umpire in the American League that knows nothing about the game of baseball. That’s unbelievable. When it comes to bloviation such as Harrelson’s, details matter. And in this case, the details validate Wegner. Quintana was making just his second career start, and by appearances had been coached in his actions. Prior to the pitch, Pierzynski set up almost mindlessly over the middle of the plate, and as the fastball sailed wildly inside, the catcher didn’t so much as make a stab at it—almost as if he knew in advance where it was headed. Pitchers usually miss by inches; Quintana’s shot was close to four feet from Pierzynski’s target. Zobrist called it “painfully obvious” in a Tampa Bay Times account. Ventura expressed shock at the ejection, less for the causality than the lack of warning from Wegner. Quintana offered some odd detail about Pierzynski having changed signs on him and not wanting to mix things up. Pierzynski said he had set up away, but Quintana threw it in. Difficult as it is to believe them, at least it’s the type of thing they’re supposed to say. Ultimately, the White Sox had taken an extra, unnecessary shot, and a warning from Wegner at that point would have validated their strategy, giving them a freebie by stifling the Rays. They have got to do something about this, I’ll tell you. They have got some guys in this league who have no business umpiring. They have no business umpiring because they don’t know what the baseball is about. And he is one of them. . . . He ought to be suspended and if they want to keep him as an umpire, send him back to school and teach him what this game is about. Even as Harrelson ranted, Zobrist simply stood in the batter’s box, a slight smile tracing his lips. It could have been relief at avoiding what might otherwise have been a painful message. Or perhaps he was delighting in the fact that Chicago would be going to its bullpen earlier than expected. Maybe it was simply that justice had been served, and he knew it. It’s certainly more than one could say for the Hawk at that moment. This article also appeared, in slightly different form and with an actual photo of Pierzynski’s questionable slide, at Sports Illustrated.com. Putting aside the ranting delivery, Hawk’s point is that a warning should have been issued – to both teams first. Instead Wegner skipped that ‘protocol’ and ejected the SOX starting pitcher. Ed Farmer, Steve Stone and a host of other announcers – in a much more calm way – concurred. If it’s said that the A.J. bean is retaliation from previous day – many at-bats later, then fine, Wegner should have warned the benches then. I’d have had no problem with an earlier warning from Wegner, but at the time, it appeared to be unnecessary. you might want to go back to the box score of that game. Cobb hit both Pierzynski and Gordon Beckham and he got no warnings. Two White Sox actually got hit by a pitch that game, no warning or anything from the umpire. Quintana doesn’t come near the Rays player with a pitch and he gets tossed. That is why Hawk was mad. Isn’t there something in the code that says, as a pitcher, if two of your players get hit, your teammates will be pissed if you don’t hit one of theirs? Its painfully obvious that you didn’t watch the game. The AJ hit was one of 3 things that happened that in the game that led to the missed beaning of Zobrist. What the writer doesn’t acknowledge is the huge disparity in HBPs the Sox saw in 2011 as a motivating factor (84 for them, 44 for the Sox). And commenter Brian makes a great point about the oversight on the writer’s part about Beckham also being plunked (not to mention De Aza in the first game of the series). So, yeah, if you are going to talk about Pierzynski coming in spikes high on Zobrist, you might want to give a full account of the series. I totally agree with the sentiments outlined by your opposing commenters. To add to the who got in the last shot, it should be mentioned that the Rays pickoff throw that was 6 feet wide of 2nd base drilling White Sox outfielder DeAza. I have never seen someone throw a ball that far wide and drill somebody doing it. 3 White Sox players hit, no Rays hit. Look, Harrelson is a total hot-head, but to say that he had no warrant for his diatribe is questionable. Secondary details like Beckham being drilled in the first inning, and the collision between a pickoff throw and De Aza’s knee, can be explained away fairly easily. Beckham was hit on an 0-2 pitch with one out and one of the hottest hitters on the planet, Paul Konerko, in the hole. While it’s frequently impossible to truly determine intent in these situations, it seems extremely unlikely that — unlike the pitch to Zobrist — there was any intent behind this one. When it comes to De Aza, what is interesting, and which almost never gets discussed, is the concept that pickoff throws can be used as weapons. I’ve heard of this sort of thing, but have never encountered it in action. 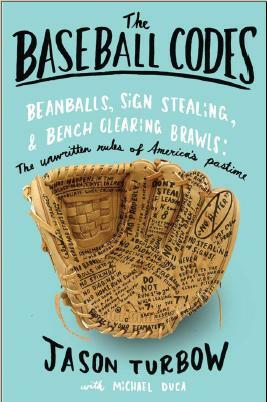 Don Drysdale claimed that the only man to have charged him, Johnny Logan of the Braves, did so from first base, after being drilled with a pickoff. However, for J.P. Howell to possess the ability to deliver a ball into a diving player’s knee while wheeling toward second base, not to mention recklessly risk sending the throw into center field as Elliot Johnson slid over to cover the base with nobody out in the inning, would take a remarkable package of guts, luck and skill. There’s virtually no way he intended to drill De Aza on the play. Which brings us to the primary participants: Ben Zobrist and A.J. Pierzynski. Say what you want about Pierzynski’s intentions or what he may have said to Zobrist behind the base — it’s all speculation. The facts as we know them are that AJP went into a fielder, spikes up and well beyond the bag; he’s made a career of effectively getting into the heads of the competition by any means necessary; and after he was hit, the White Sox specifically waited for Zobrist’s spot to come around in the order. I’m willing to buy the argument that Wegner should have issued warnings after Pierzynski was drilled, but he acted within the boundaries of reason after seeing the pieces fall into place a little too perfectly, and acting swiftly and decisively in their aftermath. While umpires routinely warn both benches (incorrectly) when there is an unintentionally hit batter (a different example of the umps going overboard), there was no such warning after Beckham got hit. But there should have been a warning to the Rays after AJ got hit, because it was obviously intentional. There wasn’t. That was the ump’s first screw up right there. And that warning should have gone solely to the Rays. There should not have been a warning to the Sox at that point, because the series total was 3 Sox beaned, 0 Rays beaned. Guess what umps, regardless of intention or not, you get to 3-0 in beanings, there will be an intentional one coming back, if only to remind the other team that their hitters could get hurt if their pitchers don’t get better at controlling their pitches. Regardless, there was no warning to either team before Quintana threw behind (again, did not even hit) Zobrist. At that point,there should have been a warning to the Sox, because you can’t throw at someone intentionally, but there is no way that Quintana should have been tossed from the game, he did not even hit the guy! This was the ump’s second screw up. That was Hawk’s gripe, and he was absolutely correct. Quintana flat out should not have been tossed without a prior warning, and no prior warning was warranted because it was 3 Sox beaned, 0 Rays beaned. The reason that intention beanings happen is to protect the pitcher’s teams’ hitters. That is all Quintana was doing, and that is permissible under the “baseball code of conduct”. No matter how you look at it, Wegner flat out blew it.